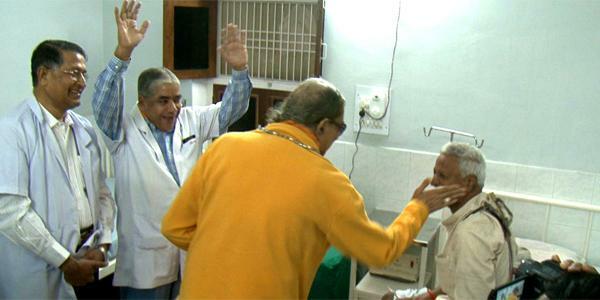 On November 5th, 2003 in Mangarh, a small village near Allahbad, The Kripalu Charitable Hospital was opened by the Governor of U.P. Dr. Vishwakant Shastri. In the spirit of Jagadguru Kripalu Parishat’s commitment to serve the under privileged the hospital medical services are available 24-hours to the rural population of approximately one million. The average daily wage of nearby villagers is often less then one-dollar, making adequate health care unaffordable. All the services at Kripalu Charitable Hospital are free of charge. Patients are welcomed and cared for with love and respect. Approximately 400 patients are seen every day. A volunteer staff of trained professionals conducts all diagnostic procedures to ensure quality health care. Periodic eye camps are organized. At the hospital free cataract surgery is available to needy villagers. All the services at Kripalu Charitable Hospital are available free of charge. The professionally run and well stocked pharmacy ensures quick distribution of medicines. This medicine is provided free of charge. Through the health care it provides, Kripalu Charitable Hospital offers hope and happiness to thousands of villagers. The next important project of Jagadguru Kripalu Parishat was the construction of charitable hospital in Uttar Pradesh in Barsana village located in the holy district of Braj. Every year thousands of pilgrims visit the village of Barsana and the surrounding holy places. Jagadguru Kripalu Parishat Rangeeli Mahal ashram is located in this spiritual center. 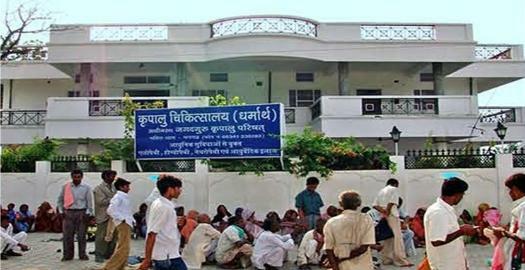 Two acres of land adjoining Rangeeli Mahal were acquired for the hospital. Architectural drawings have been finished. Although spiritually rich, this area is economically very poor. Health care is limited and inadequate. When in operation, this hospital will serve a rural population of nearly two hundred thousand. This project is made possible with the help of generous supporters like you. You can change the life of thousands of needy people by making a generous donation. Patients are entitled to the following treatments completely free of charge: Doctor’s consultation, allopathic, homeopathic and ayurvedic medicines prescribed by the hospital doctors, pathology investigations, X-rays, ECG, ultrasound, surgery, in-patient facilities, ambulance and emergency services.